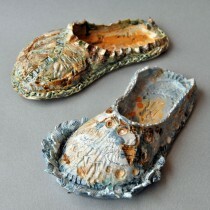 Making ceramic shoe sculpture as a metaphor for my Life-Walk. A three day workshop: includes art instruction, meals, beverages and snacks, clay, glazes, and kiln firing. Simple lodging is provided. 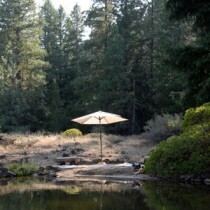 Temenos Wild is located 3700 feet in the mountains halfway between Ashland and Klamath Falls. This piece of earth surrounded by hundreds of acres of wildness, is a beautiful and peaceful retreat. 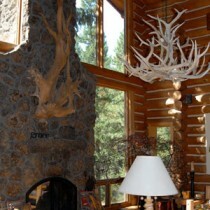 The lodge-like log home embodies the trees in their most splendid contribution to our shelter. 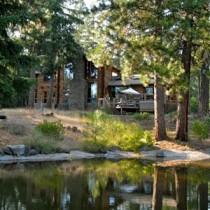 There is a creek-fed pond for swimming and a hot tub for soaking under the stars. Bunk bed lodging is available, or pitch a tent for a little more privacy if desired. The Temple Barn where the workshop is held is a ceramics studio created to magnify the sacredness of Spirit through the arts, dance, music, movement and play! Come to bless it, and receive its blessings. The Boots for My Journey workshop is a bridge from my dream to you that offers active participation in your own healing through art. A willingness to explore your inner world with compassion–and the desire to move forward–becomes the foundation from which your boots are formed. As in the dream, the intangible becomes tangible when your life stories are infused into clay and formed into boots or shoes as a metaphor for your Life-Walk. EACH WORKSHOP COSTS $370.00 SIGN UP NOW – SPACE IS LIMITED! For more information regarding preregistration please contact Liisa Rahkonen.